Tuscan pici pasta all’etrusca is a typical pasta recipe from Tuscany. 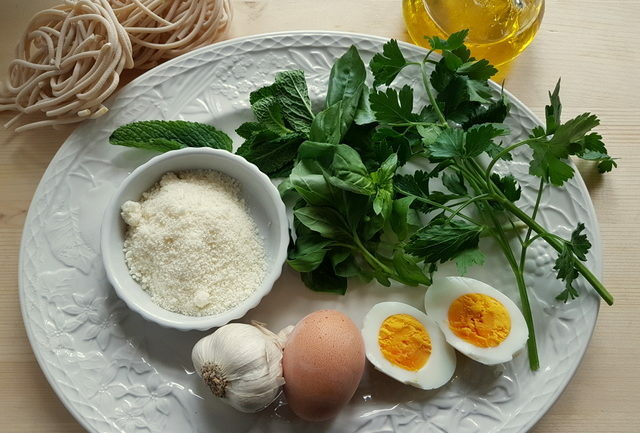 It’s made with pici, a traditional hand-rolled pasta that looks like very thick spaghetti strings and a delicious pesto type sauce made with hard boiled eggs, garlic herbs, olive oil and pecorino. I’m not sure why this recipe is called all’etrusca, but pici is one of the oldest types of pasta in Italy, said to date back to Etruscan times. In fact, there is a fresco in an Etruscan tomb in ancient Tarquinia which shows a servant carrying a bowl of thick long pasta, which many believe to be pici. That tomb dates back to the 5th century B.C! 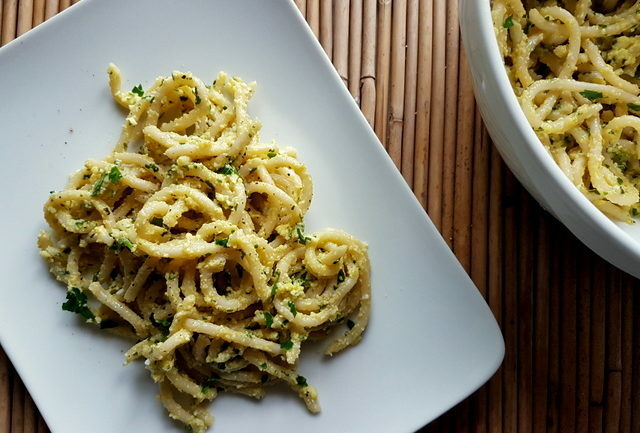 There are a number of other Italian pasta recipes named all’etrusca. However, they differ in the ingredients. I found one with cheese and ham and another with mushrooms, sun-dried tomatoes and pine nuts! 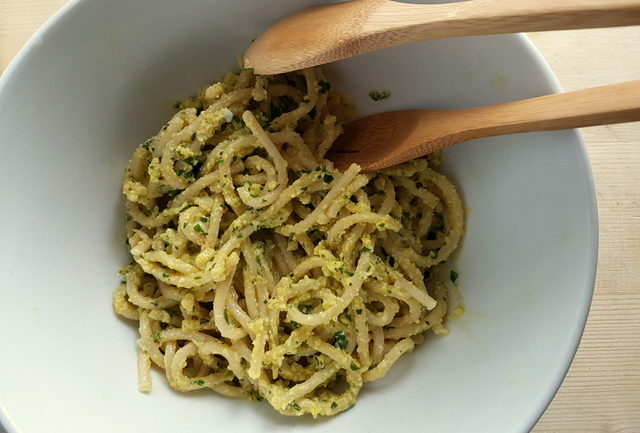 But, recipes for Tuscan pici all’etrusca are all the same as this one. So, I assume that this is a recipe very particular to Tuscany. 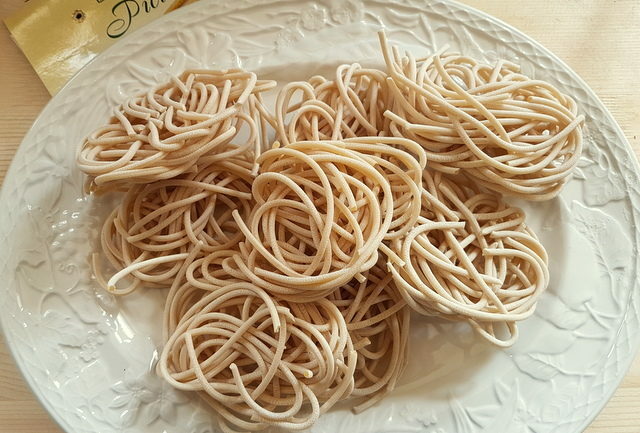 This is the first recipe I have posted for pici pasta. I was attracted to the idea that Tuscan pici pasta all’etrusca includes hard boiled eggs. This is quite unusual in pasta recipes. 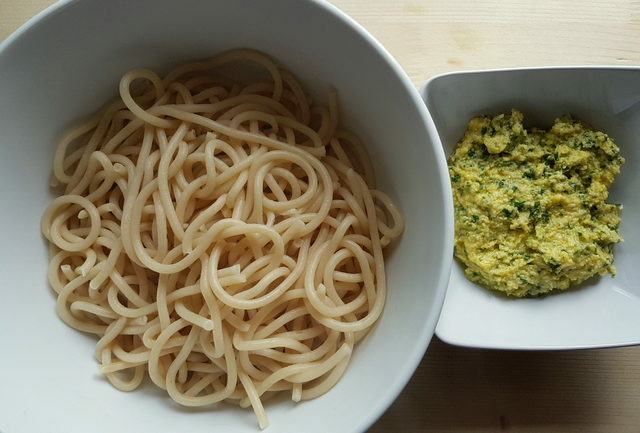 The combination of the egg with the garlic and herbs (fresh mint, basil and parsley) really gave this sauce a wonderful texture. It’s creamier than other types of pesto and, I would say has a fresher taste! Obviously, in Tuscany they use Tuscan pecorino and Tuscan extra virgin olive oil. I didn’t have either! Although, of course, living in Italy means I can find very good pecorino and extra virgin olive oil. I think when making no-cook recipes the quality of the ingredients is extra important. It’s best to use cheese that you have to grate yourself, rather than ready-grated and a good quality extra virgin olive oil. I used dried pici. In Tuscany, it would most probably be hand-made! 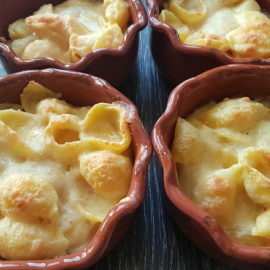 I am planning to make some myself very soon and have added it to my to-do pasta list! However, the dried pici I bought was really good. It took a surprising 19 minutes to cook (apparently that’s normal for dried pici) but, it was nicely firm without being mushy and because of the rough surface of the pasta, the sauce adhered to it really well. So, every mouthful was yummy! I know pici can be bought online, even outside of Italy. I have seen it on Amazon and many other sites. 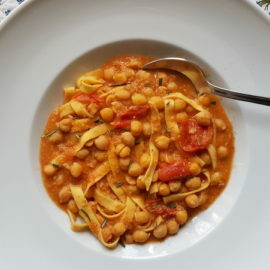 But, if you can’t find pici and don’t want to make it yourself, this recipe can be made with other types of long pasta. I would suggest a thick spaghetti or bigoli, or perhaps even linguine. 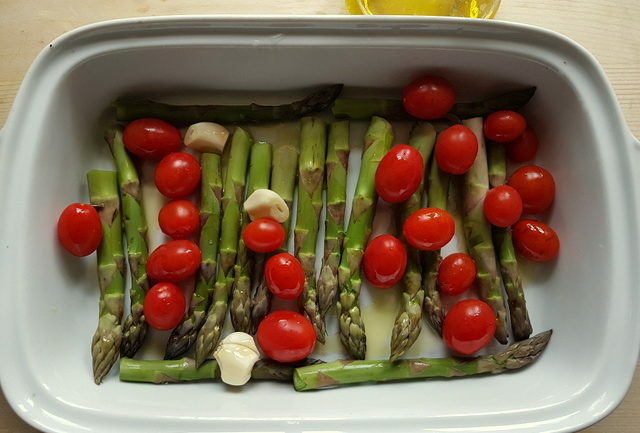 All’etrusca with roasted asparagus and cherry tomatoes. I often eat pesto as a dip or on bread. I think this sauce would be pretty yummy eaten that way as well! 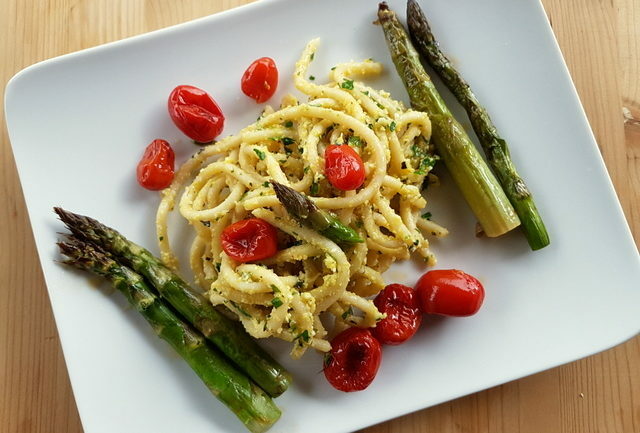 Since it’s asparagus season, I served this dish with roasted fresh green asparagus and roasted small pacchino tomatoes! I just put the veggies in an oven dish with 3 whole peeled garlic cloves and some olive oil and roasted them for about 20 minutes in a pre-heated oven at 180°. Do give this Tuscan pici pasta all’etrusca a try. 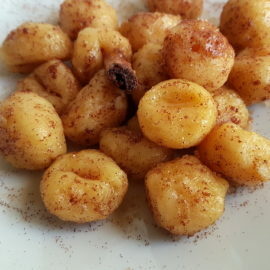 It’s very tasty, original and quick and easy to make! 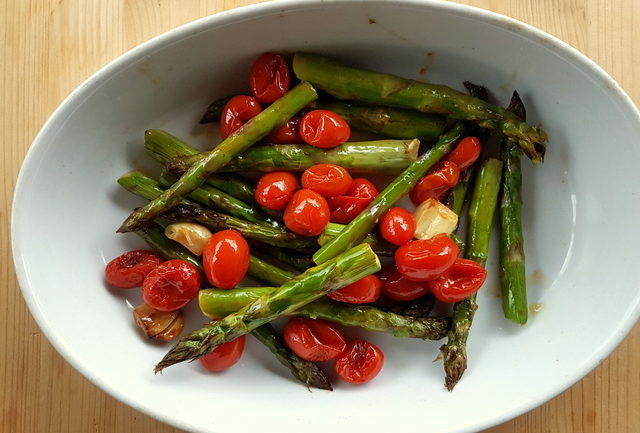 And if it’s asparagus season where you are add some of those and some roasted cherry tomatoes too! 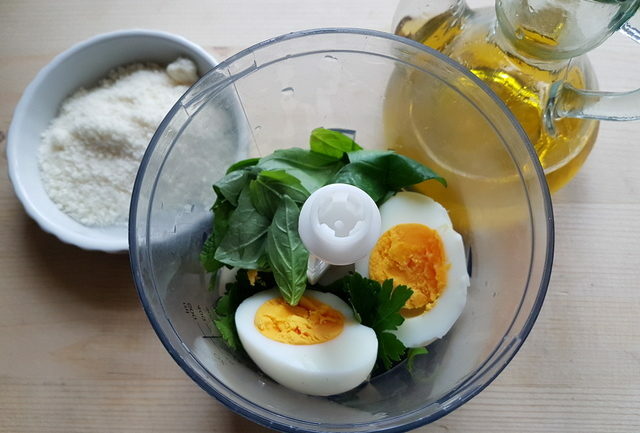 Oh, I love the fact that this pesto is made with hard boiled eggs! Of course, we love carbonara, which I probably didn’t spell right in the US! My family will totally love this! As always, I love the history you give us on the origins of pasta!! Thanks! I love learning about the different types of pasta dishes your share. This one is new to me. It sounds very flavorful with the fresh herbs and roasted veggies! I love how healthy this recipe is. We are pasta lover and definitely trying this. I like the herb mixture in it, we never tried it yet on our pasta meals. Thank you Arjhon! Yes this is a pretty healthy way to eat pasta, just hard boiled eggs and raw ingredients. I’m sure you’ll love it if you try it. Regards Jacqui!